The International Association of Home Staging Professionals (IAHSP) is hosting the 2018 IAHSP Conference & Expo Oct 18-20 in Charlotte, NC. Keynote Speakers for this event are Drew & Jonathan Scott - HGTV's "Property Brothers." Top industry professionals will be speaking and sharing business strategies and success tips with attendees from around the world. 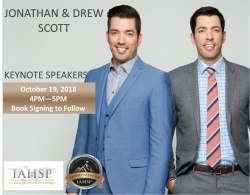 Littleton, CO, September 02, 2018 --(PR.com)-- The International Association of Home Staging Professionals® (IAHSP®) Hosts the 2018 IAHSP® Conference & EXPO with Keynote Speakers, The Scott Brothers. The International Association of Home Staging Professionals® (IAHSP®) is hosting their annual Home Staging Industry Conference & EXPO Oct 18-20 in Charlotte, NC. Top industry professionals will be sharing on business, marketing and success topics to the over 300 attendees from around the world. Keynote Speakers for this event are Jonathan and Drew Scott – HGTV’s “Property Brothers,” who are going to share their business insights and advice for success. We also have over 30 industry companies that have partnered with IAHSP in support of the EXPO and Conference. This event is open to all in the Home Staging, Decorating, and/or Design industries who would like to be more successful. Go to www.iahspconexpo.com to learn more about the IAHSP® Conference and EXPO and to purchase tickets. “The International Association of Home Staging Professionals® (IAHSP®) has hosted educational conferences since 2003, and we provide an educational offerings to all attendees to keep them on top of industry trends. This year all attendees will earn their Luxury Home Staging Designation (IAHSP-LHS), as well as learn and be inspired by our 17 top speakers. The event will also feature the 2018 IAHSP Staging Industry Awards for deserving individuals and teams,” said Jennie Norris, IAHSP® Chairwoman. Jennie Norris is the Chairwoman for IAHSP® and has served in industry leadership since 2003. She is a professional Home Staging Trainer and marketing guru. She owns and operates Sensational Home Staging serving the Denver region, and has personally Staged over 4,500 properties since 2002. For more information, contact Jennie Norris at your 720-800-5485, jennie@iahsp.com, www.iahsp.com, www.SensationalHome.com. IAHSP® is the premier Home Staging Industry Association for professional home stagers, designers, decorators and redesigners with thousands of members worldwide. Since 1999, IAHSP® has helped guide the Staging industry with Education, Excellence and Ethics standards. The IAHSP Foundation is a 501-C3 Charitable Organization supporting Worldwide Staging Service Week®. For more information on IAHSPCONEXPO visit www.iahspconexpo.com. For more information about the awards, please visit IAHSP Staging Industry Awards. For more information about Home Staging or partnerships with IAHSP®, call 844-IAHSP99 and speak with Christa Jessup, or visit the IAHSP® website at www.iahsp.com.